British Columbia’s already vulnerable salmon populations are put increasingly at risk through the provinces “Gateway Program”. The Gateway Program is a plan to build and expand highways, bridges, railroads, rail yards, and port facilities, encouraging trade with Asia-Pacific (Cuff 2007). Unfortunately, this development will have an extreme impact on our air quality, our marine and river habitat, and our local wildlife (Ibid). 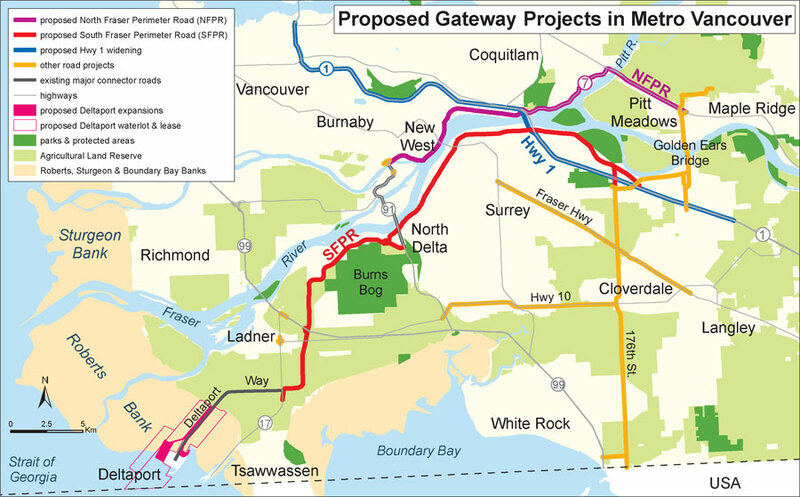 Specifically, the Gateway Program will have an adverse affect on our pacific salmon populations through the construction of a major highway known as the South Fraser Perimeter Road (Ibid). The South Fraser Perimeter Road (SFPR) is a proposed highway that will follow the south side of the Fraser River (see fig. 1). The Fraser River watershed drains almost one-third of the province, extends from the Rocky Mountains to the mouth in Vancouver, and spans a distance of 1,400 km (Rand et al 2006). The Fraser River is the largest salmon-producing river system in Canada (Farrell et al 2008) and a large contributor to our provincial economy (Cox & Hinch 1997). By building a highway along the Fraser River, salmon populations will be affected in three main ways: through highway construction, highway presence, and increased urbanization (Wheeler et al 2005). This will, in turn, negatively affect our local economy and provincial food security. Presently, our salmon populations are barely sustainable and are increasingly vulnerable to environmental changes. The collapse of our BC sockeye salmon population this year has created an extreme problem for First Nations food security and for the provincial economy. BC’s Fraser River this August expected 10.6-13 million sockeye salmon returning to natal spawning grounds and only 1.7 returned (Hume 2009). The collapse caused sockeye fisheries on the Fraser River to close in July, causing a serious problem for First Nation’s communities who relay on salmon for sustenance and a principal source of protein (Karp 2009). Increased construction, pollution, and greenhouse gas emissions produced by the new South Perimeter Road highway will only increase the fragility of the salmon ecosystems, and decrease the resiliency and sustainability of our local salmon. Our local salmon populations are born in the freshwater headwaters of the Fraser River. Once mature enough, the salmon migrate to the ocean northward to the Gulf of Alaska (Cox & Hinch 1997). Once reproductively mature (about 4 years of age), the salmon use precise homing skills to return to the Fraser River and their natal streams to spawn and, after which, die (Ibid; Rand et al 2006). Because sockeye salmon only spawn once in their lifetime, it is crucial that they succeed in their homeward migration in order to propagate. The SFPR will interfere with the migration of both sea-bound juvenile salmon and stream-bound spawning salmon, and decrease salmons’ ability to survive and propagate. During the SFPR highway construction, an increased amount of sediment will likely enter the Fraser River (Wheeler et al 2005) harming migratory salmon (Lake & Hinch 1999). Research shows that “fine sediment pollution from highway construction can immediately alter macroinvertebrate and fish communities” (Wheeler et al 2005, 145), and can reduce the amount of fish by 50% (Ibid). Sediment has such a profound effect on fish because it can clog gills causing severe damage, thus reducing feeding abilities and oxygen consumption (Ibid), and can cause anoxia, stress, and eventually death (Lake & Hinch 1999). Along with sediments, highway construction will also introduce harmful pollutants into the waterway (Wheeler et al 2005). During construction the use of heavy machinery can cause chemical pollution, and materials used for highway construction are “highly toxic to aquatic biota” (Wheeler et al 2005, 144). Because of proximity, this pollution will surely enter the Fraser River and pollute salmon habitat (Wilderness Committee n.d.). Extended use of the highway—referred to as highway presence—will continue to pollute the river and harm salmon populations. Highway and road surfaces are impervious in nature, and therefore accumulate chemical pollutants and heavy metals from automotive traffic (Wheeler et al 2005). These pollutants, including zinc, iron, lead, cadmium, nickel, copper, chromium, phosphorus, and petroleum (Ibid) are then transported into the river by stormwater (Sandahl et al 2007). Studies show that chemical concentrations are directly related to traffic volumes (Wheeler et al 2005). Thus, projected traffic increases on the SFPR will only increase pollution levels, and affect salmon in numerous ways. Toxic chemicals can increase the viability and infectivity of parasites (Couillard et al 2008). This has extreme implications on salmon because they are already prone to numerous fatal parasites that can cause kidney failure, and severe gill damage (Crossin et al 2008). Further, studies suggest that exposure to chemicals, such as PCBs, can trigger migration earlier than historically observed (Couillard et al 2008). Early migration has had detrimental effects on salmon populations as they are making their migration during warmer than average periods, which is potentially lethal as salmon are a cold-water species, and sensitive to even slight changes in temperature (Ibid). Lastly, copper in urban runoff damages the olfactory sensory epithelium in pacific salmon (Sandahl et al 2007). A major source of copper in runoff is emissions from automotive exhaust and brake pad wear (Couillard et al 2008). Studies show that “copper is a neurobehavioral toxicant in fish” (Sandahl et al 2007, 2998) damaging their olfactory sensors that they rely on to detect food, navigate to natal spawning grounds, and avoid predators (Ibid). Mortality rates will therefore increase as salmon will be unable to detect chemical alarm cues and predators, find food, or find natal spawning grounds (Ibid). Exposure to even modest amounts of copper can cause permanent damage (Ibid). Studies show that highway growth encourages “sprawling development” and increases urbanization (Cuff 2007). In turn, this will increase the amount of harmful pollutants being emitted into our atmosphere and our aquatic environments. Because copper has a wide variety of industrial, commercial and residential uses, copper in urban runoff will continue to increase with urban expansion (Sandahl et al 2007). As our salmon become increasingly exposed to heavy metals, toxic chemicals, and PCB’s our local food security will continue to be affected. By consuming contaminated fish people put their own health at risk, impinging on peoples right to food security, food sovereignty, and access to local healthy food—that is if pacific salmon will even be available to consumer. Because of the Gateway Project, GHG emissions are predicted to increase by 31% (Cuff 2007). Global warming resulting from an increase in GHG emissions will further increase water temperatures and thus increase salmon mortality in BC. Increased water temperatures cause extreme exhaustion, energy depletion (Crossin et al 2008), smaller stock size (Cox et al 2008), and susceptibility to disease in Pacific salmon (Crossin et al 2008). This will therefore decrease reproductive capabilities and increase mortality rates. Through highway construction, presence, and inevitable urbanization, Gateway’s SFPR will damage the Fraser River and cause mortality among pacific salmon. Our provincial salmon are currently declining at alarming rates, proving they are living in an already fragile ecosystem. The SFPR will only contribute to this fragility by polluting the Fraser River, increasing sedimentation, and increasing water temperatures through global warming. In the face of the Gateway Program, our local salmon have little to no chance of survival—negatively affecting our regions biodiversity, economy and food security. Couillard, Catherine M., Robie W. Macdonald, Simon C. Courtenay, Vince P. Palace. 2008. Chemical—environment interactions affecting the risk of impacts on aquatic organisms: A review with a Canadian perspective—interactions affecting exposure. Environmental Review, 16: 1-17. Cox, Sean P., Scott G. Hinch. 1997. “Changes in size at maturity of Fraser River sockeye salmon (Onchorhynchus nerka) (1952-1993) and associations with temperature.” Canadian Journal of Fisheries and Aquatic Sciences 54: 1159-1165. Crossin, G.T., S.G. Hinch, S.J. Cooke, D.W. Welch, D.A. Patterson, S.R.M. Jones, A.G. Lotto, R.A. leggatt, M.T. Mathes, J.M. Shrimpton, G. Van Der Kraak, and A.P. Farrell. 2008. “Exposure to high temperature influences the behaviour, physiology, and survival of sockeye salmon during spawning migration.” Canadian Journal of Zoology 86:127-140. Hume, Mark. 2009. Fraser River’s salmon stocks ‘beyond a crisis.’ Globe and Mail, online, 13 August 2009. Lake, Randal G., Scott G. Hinch. 1999. Acute effects of suspended sediment angularity on juvenile coho salmon (Oncorhynchus kisutch). Canadian Journal of FIsheries and Aquatic Science, 5:862-867. Rand, P.S., S.G. Hinch, J. Morrison, M.G.G. Foreman, M.J. MacNutt, J.S. Macdonald, M.C. Healey, A.P. Farrell, D.A. Higgs. 2006. “Effects of River Discharge, Temperature, and Future Climates on Energetics and Mortality of Adult Migrating Fraser River Sockeye Salmon.” Transactions of the American Fisheries Society 135: 655-667. Sandahl, Jason F., David H. Baldwin, Jeffrey J. Jenkins, Nathaniel L. Scholz. 2007. A Sensory System at the Interface between urban Stormwater Runoff and Salmon Survival. Environmental Science and Technology, 41: 2998-3004. Wheeler, Andrew P., Paul L. Angermeier, Amanda E. Rosenberger. 2005. Impacts of New Highways and Subsequent Landscape Urbanization on Stream habitat and Biota. Reviews in Fisheries Science, 13:141-164. Would You Rather Throw it Out? It is there. Right there. UBC Farm on the Map: Is the Farm Finally ‘Saved’? The Maya Garden; Culture in Peril? GMOs banned in Ireland, voluntary GM free label for food to create competitive advantage. New Study claims meat creates half of all greenhouse gases! !